At this time, there is no single test that can accurately diagnose Alzheimer’s Disease. Doctors use a variety of assessments and examinations to make a final diagnosis. Each of these are discussed below. Doctors often use a range of tests to assess memory, problem solving skills, attention span, coordination, and abstract thinking abilities of a person. There are many different types of neuropsychological tests that can be used in the diagnosis of Alzheimer's disease, and these can help doctors determine the type of dementia a person may have, and to measure the disease's progression over time. Additionally, these tests can provide a thorough description of the behavioral symptoms so that they can be appropriately managed and monitored. The tests are also used to evaluate the effectiveness of the medications prescribed for the treatment of Alzheimer's disease. The MMSE is the most commonly used test and takes about 10 minutes to complete. Patients may be tested a number of times over a longer time period (such as every 6 months) to determine the rate of decline in performance over time. CT and MRI scans both generate excellent images of the internal structure and condition of the brain. 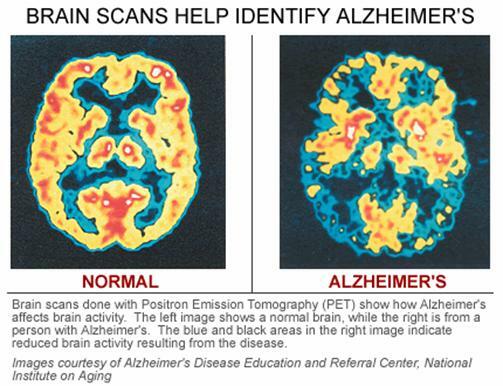 PET scans can be used to monitor brain activity but are not typically used in the diagnosis of Alzheimer's. While CT, MRI and PET scans can detect important changes associated with dementia, a diagnosis cannot be based solely on a brain scan. Sometimes brain scans will reveal no significant changes in the brain. A Computerized Tomography (CT) scanner is a specialized form of X-ray machine. Unlike an ordinary X-ray machine, which sends a single X-ray beam though the body, a CT scanner simultaneously sends several X-ray beams from different angles to produce highly detailed, three dimensional images of the internal structure of the brain. Magnetic Resonance Imaging (MRI) scans use magnetic and radio waves, instead of X-rays, to provide very clear and detailed images of brain or other internal organs. MRI scans provide static three dimensional images of brain structure. Specialized MRI scans can also be used to monitor brain activity in areas of the brain where speech, sensation, memory and similar functions occur. Positron Emission Tomography (PET) scans detect special radioactively labeled tracers which are injected into a patient's body before the imaging procedure starts. PET scans can be used to accurately monitor brain activity while a patient's memory and cognition are being tested. PET scans can determine brain activity and function by measuring differences in blood flow and the usage of glucose (sugar), both of which increase when an area of the brain is active. PET scans provide information about brain function and activity as opposed to brain structure, and are more typically used in research. Single Photon Emission Computed Tomography (SPECT) scans produce a three dimensional picture of blood flow into particular regions of the brain. In the future, SPECT scans may be able to identify characteristic signs of Alzheimer's disease and distinguish it from other types of dementia. For instance, studies have demonstrated that people with Alzheimer's disease tend to have reduced blood flow into brain areas responsible for vocabulary and geographical information. SPECT scans are currently being evaluated in a clinical setting and are not generally available for diagnosis. Functional MRI (FMRI) scans are similar to a typical MRI scan but instead of providing a static image of the brain, they can assess the brain activity and blood flow. FMRI scans are used mainly in a research setting. Laboratory tests that can accurately diagnose dementia are not yet available. However, doctors will investigate liver, kidney, and thyroid function, blood count, vitamin levels and glucose levels through laboratory blood and urine tests to help rule out the possibility that the symptoms are caused by something else may have some symptoms like Alzheimer’s. See Other Possibilities / Causes on section 6.2 above. While most cases of Alzheimer’s Disease are not directly caused by a gene, there are some identified genetic links. For a fuller discussion of the genetics of Alzheimer’s disease, see the Cause page. There are genetic tests for these genes, but they are typically only necessary in cases where there is a family history of younger onset dementia. The E4 sub-type of the apolipoprotein E (ApoE) gene increases the risk of developing late onset Alzheimer’s disease, but does not cause the disease. It is important to emphasize that while the ApoE4 variant may increase risk of developing late onset Alzheimer’s disease, having the ApoE4 gene does not mean that a person will develop the disease. Therefore, while ApoE4 gene tests do exist, they are usually not recommended.